"World's record speeds are decided by fractions of a second. Tuning a car for a world mark is therefore a battle against time. To win, you must have a combination of a perfect car, the right course and favorable weather. And I am going to add another requisite–luck, which always plays a large part in such undertakings. By luck I mean what Americans call having the "breaks." 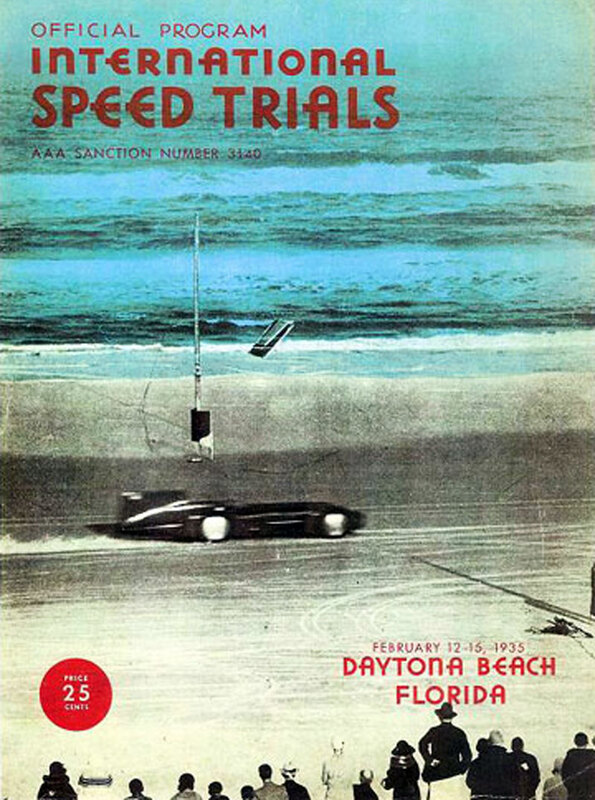 Daytona Beach, Florida is the only place I know where it is possible to make world's land-speed records. The sand packs almost as hard as cement, and there is sufficient length to get up speed." –Sir Malcolm Campbell (May 1932). 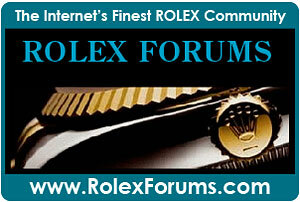 The modern Rolex Daytona is perhaps the most sought after watch in the collectable watch world. 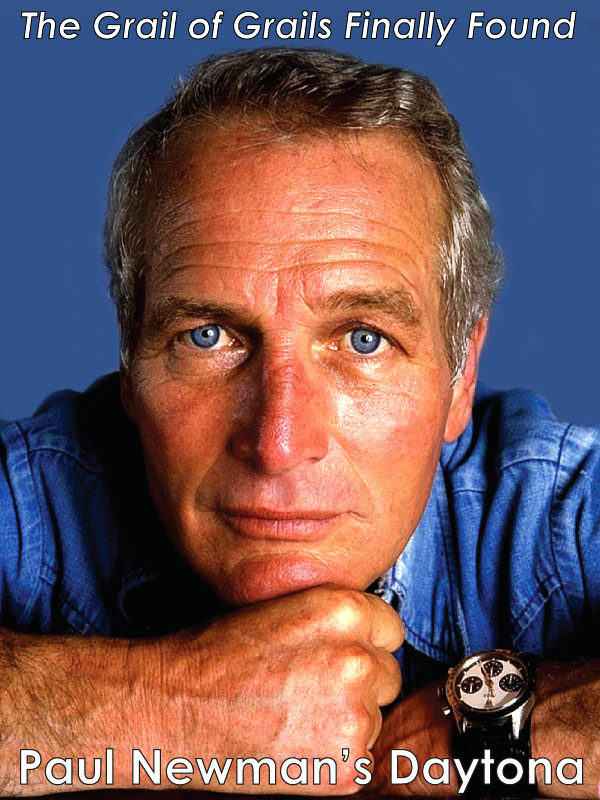 The term Rolex Daytona conjures up images of Paul Newman and the annual Rolex 24 at Daytona International Speedway which began in 1962. 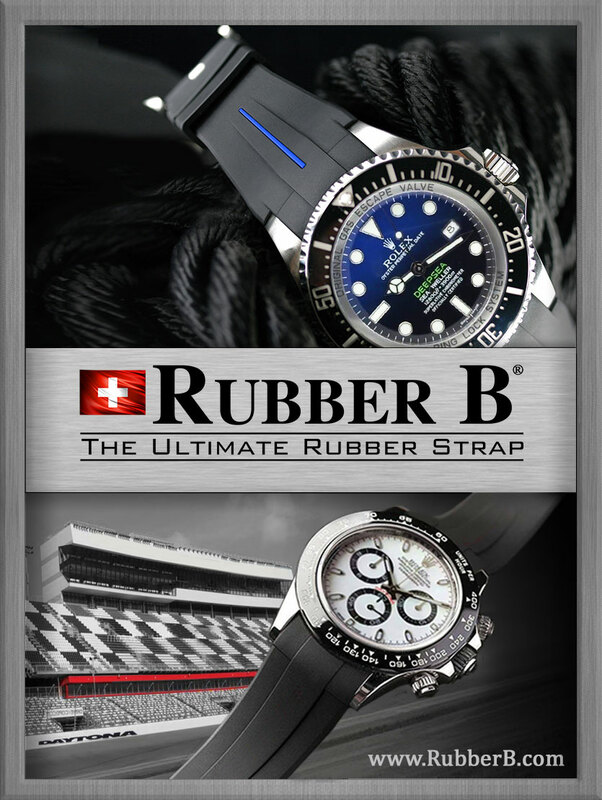 Many famous racing names have been intimately associated with Rolex throughout history including Roger Penske, A.J. Foyt, Sir Jackie Stewart and Derek Bell–to name just a few. 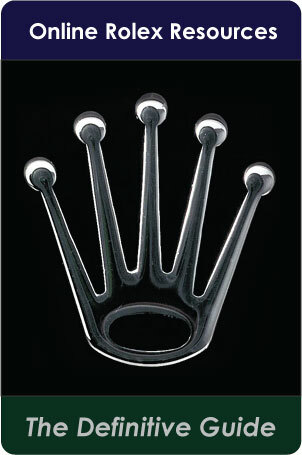 Many famous race car drivers wore and wear Rolex watches including Steve McQueen, Paul Newman and Richard Petty. These are men of achievement who always pushed the envelope. 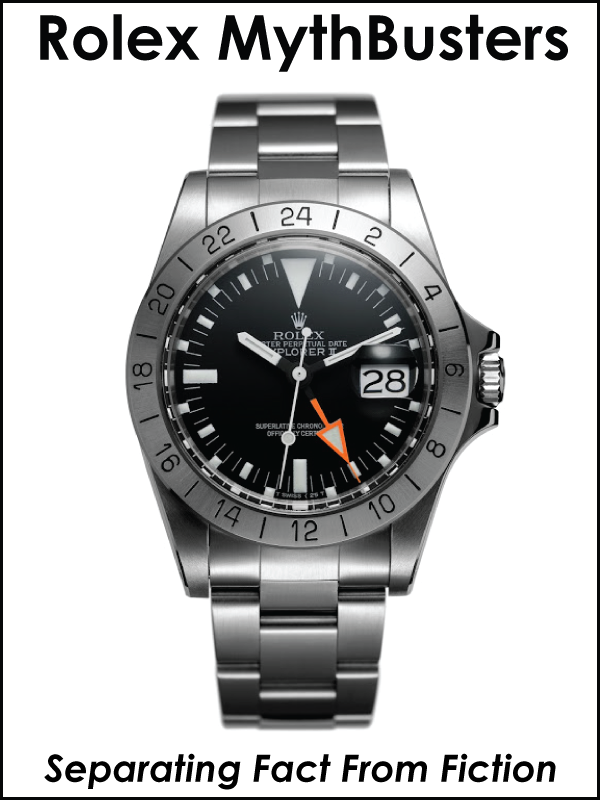 Before NASA astronauts flew to Moon on Apollo Rockets wearing Rolex watches; before William Knight broke the record becoming the worlds fastest man when he flew the hypersonic x-15 at mach 6.7 in 1967 while wearing his Rolex; before Chuck Yeager broke the speed-of-sound barrier while wearing his Rolex Oyster in 1947, there was another man of amazing achievement that broke more world land and water speed records than any other man in history–and his name was Sir Malcolm Campbell. Sir Malcolm was not an ordinary man or an ordinary race car driver. 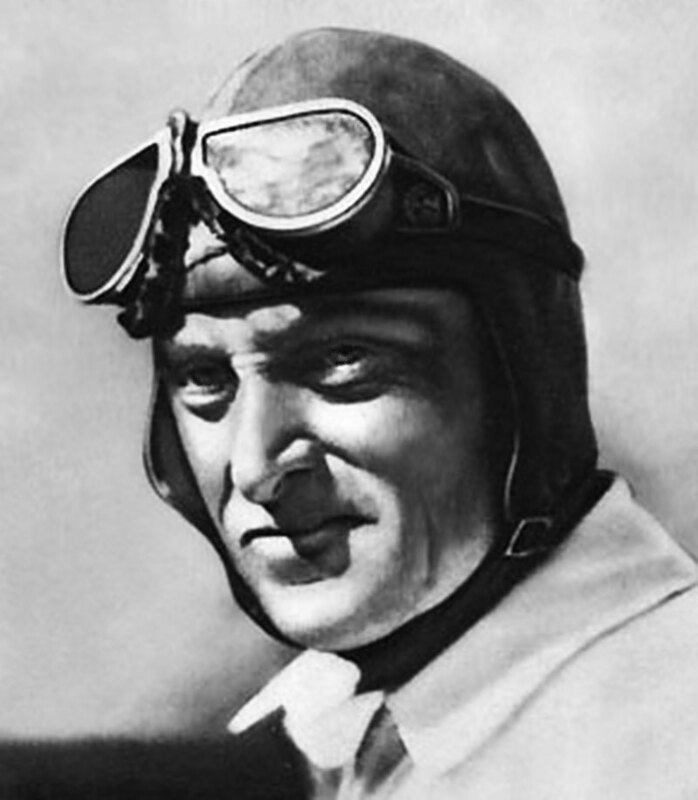 As a matter of fact, he broke the world land speed record 9 times between 1924 and 1936. As we see from the 1933 Rolex Oyster advertisement pictured below, he not only wore a Rolex but refused to allow Rolex to pay to him to wear his Rolex. 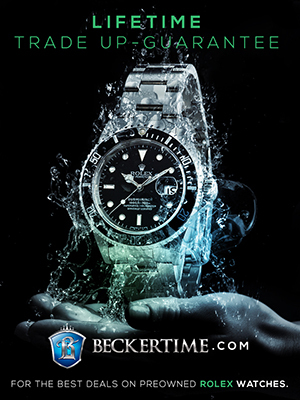 Men breaking speed records wearing Rolex watches they purchased themselves is not uncommon. When Chuck Yeager became the first man to break the sound barrier in 1947, he did it wearing a Rolex Oyster he bought with his own hard-earned money. 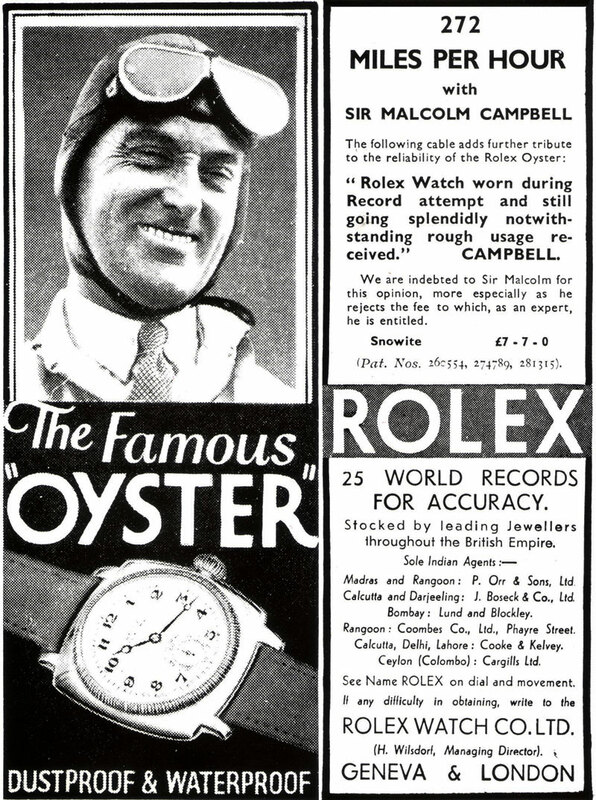 In the photo below from 1937 you see Sir Malcolm Campbell wearing his Rolex Oyster. 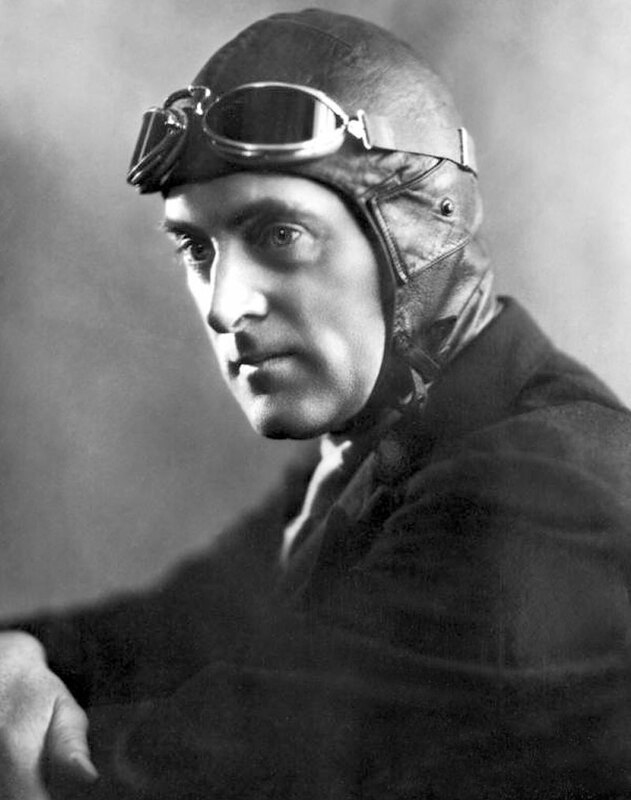 Sir Malcolm Campbell not only broke the word record for land speed, but also held the world water speed record at the same time. When he was a young man he also raced motorcycles. Malcolm Campbell was born in Chislehurst, Kent, England in 1885. He served in World War 1 in the Queen's Own Royal West Kent Regiment and in the British Royal Air Force and achieved the rank of Captain–a nickname that would remain with him the rest of his life. 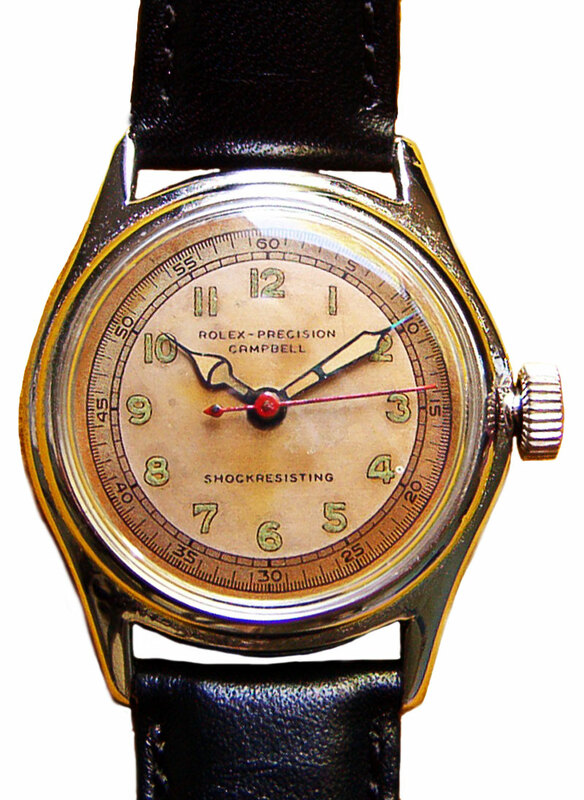 Rolex made at least one Malcolm Campbell Oyster wrist watch which is pictured below. This is really profound if you think about it. 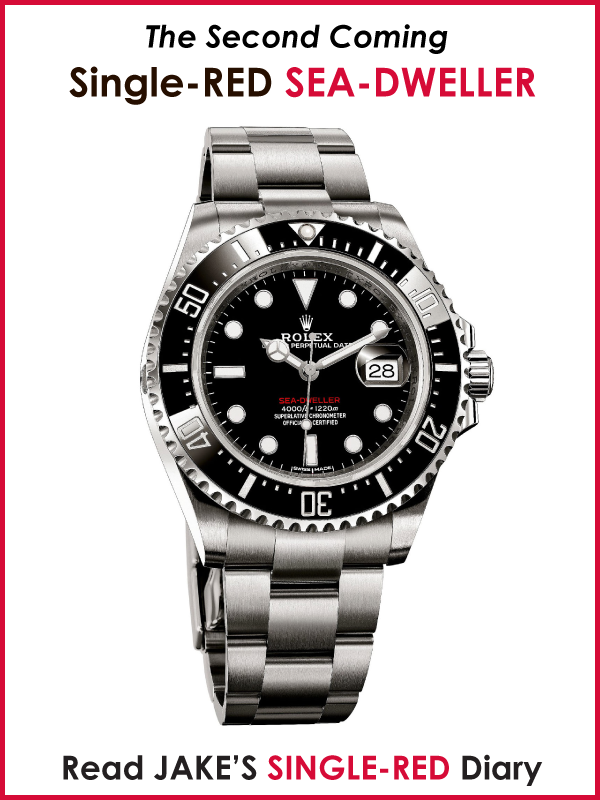 I can't think of one other example of a Rolex model named after a living person? As you will see on Abraham Lincoln's 200th birthday, later this week, Rolex named a model after him, but he was no longer alive. 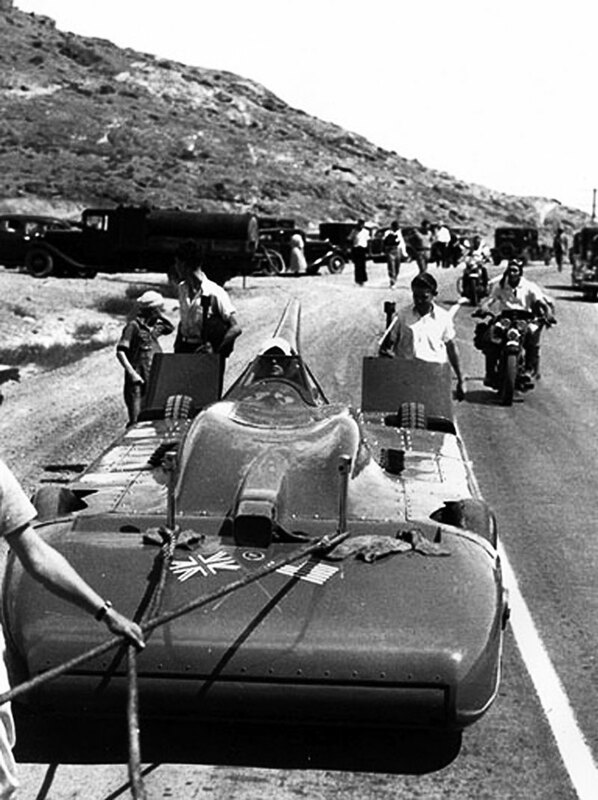 Let's begin examining the amazing land speed records set by Sir Malcolm Campbell. 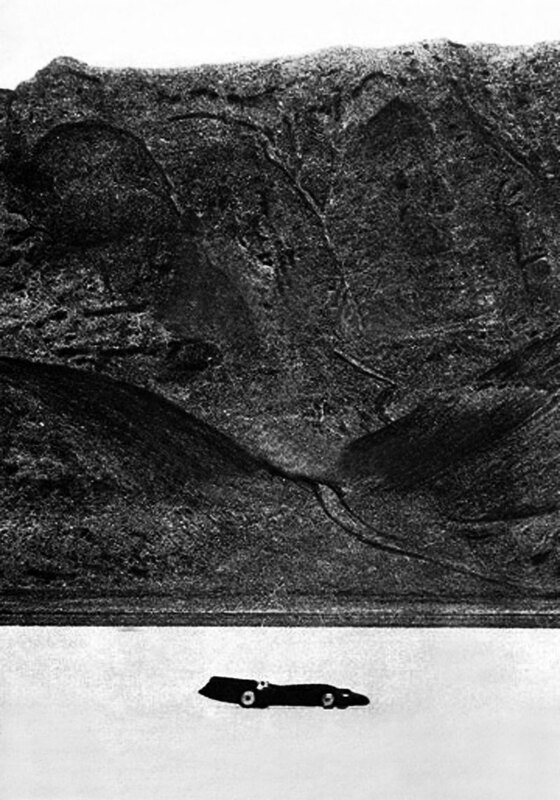 In the photo below Campbell is pictured in 1922 at Saltburn Sands, North Yorkshire, Wales, in Great Britain in his Sunbeam V12 which had a 350 Horse Power engine. 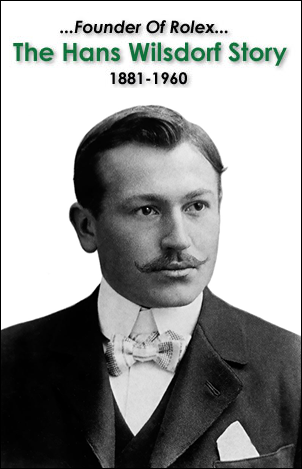 His Sunbeam was nicknamed "The Blue Bird" and on June 17, 1922 he set his first record when he drove at 138.08 mph. 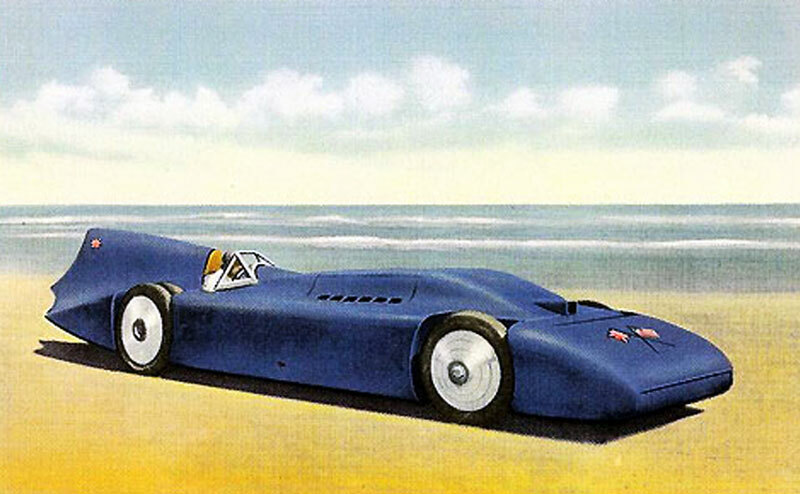 Sir Malcolm Campbell chose the name Blue Bird from the French play by the same name–written by Maurice Maeterlinck. The story is about a brother and sister seeking happiness, which is represented by the Blue Bird of Happiness. 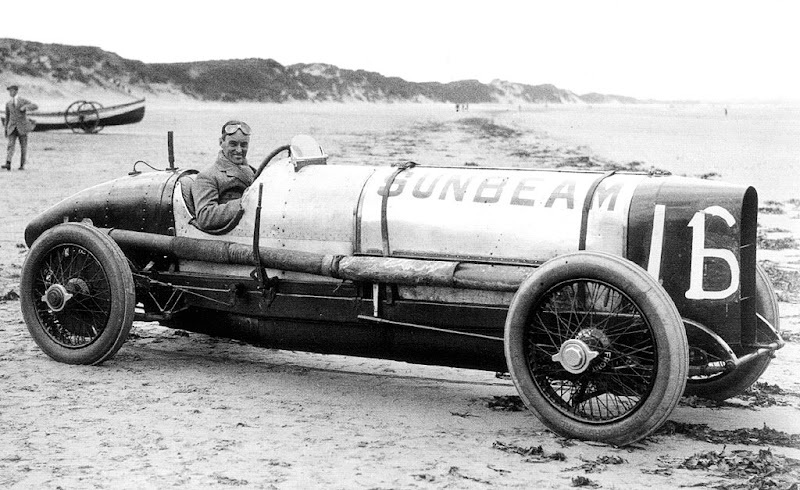 In This next photo taken in 1924, Campbell is pictured at Pendine Sands, South Wales, Great Britain in his new Sunbeam which had 550 Horse Power. He set a new record by driving his new Blue Bird at 146.2 MPH (233.86 KPH). 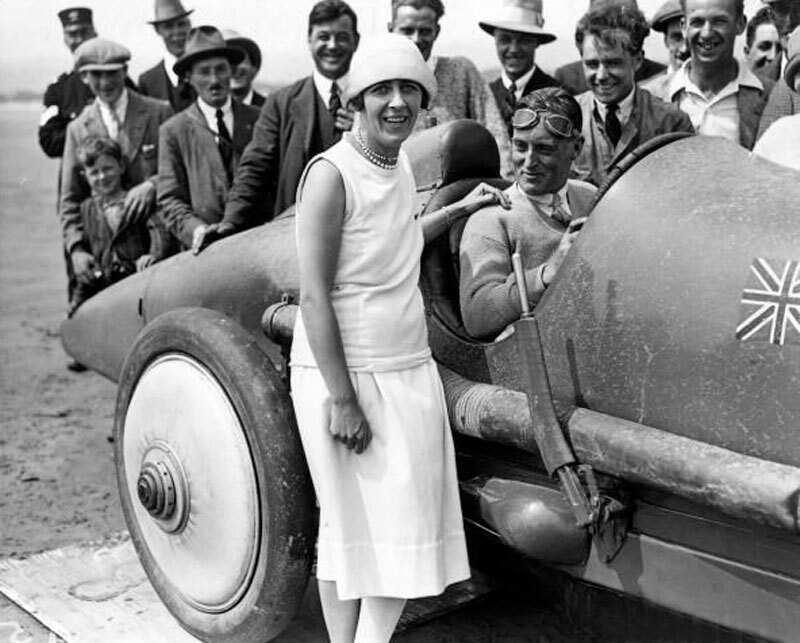 Sir Malcolm Campbell is pictured below at Pendine Sands, Wales on July 21st, 1925 with his wife, Mrs. Campbell in his Blue Bird Sunbeam after he set a new world land speed record by driving 150.76 MPH (241.22 KPH). 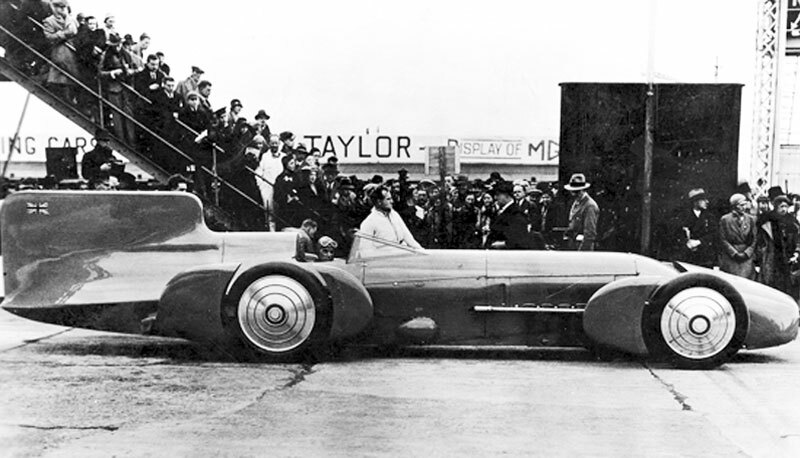 The new Bluebird was more bullet-shaped and aerodynamic, and had an art-nouveau moving into art-deco streamlined shape which contributed to the significant speed increase. 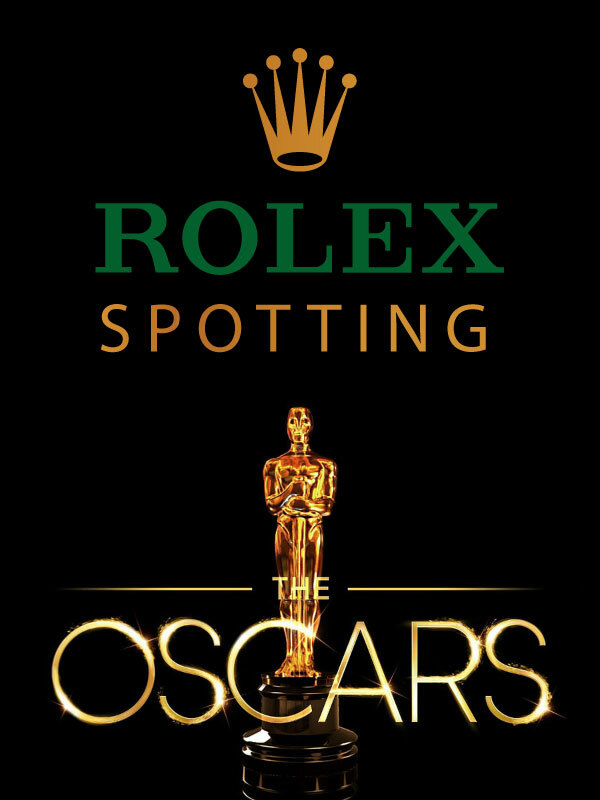 Several years after the above photo was taken, Rolex used it in the Rolex advertisement seen below. 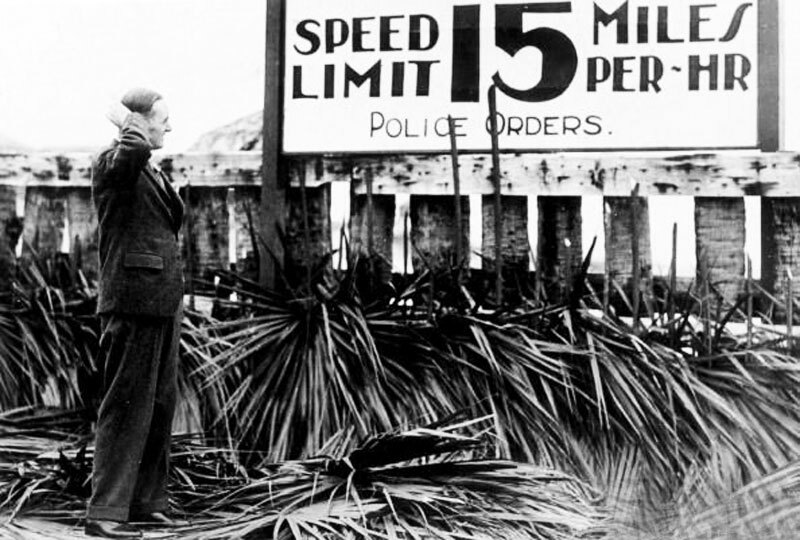 On February 18, 1928, Sir Campbell came to the United States and set another record at 206.95 MPH (331.14 KPH). In 1929 Campbell traveled to South Africa to try driving on a dry lake bed for speed, because his previous record had been beaten by an American driver named, Ray Keech. Campbell set a new record by driving 211.191 MPH. 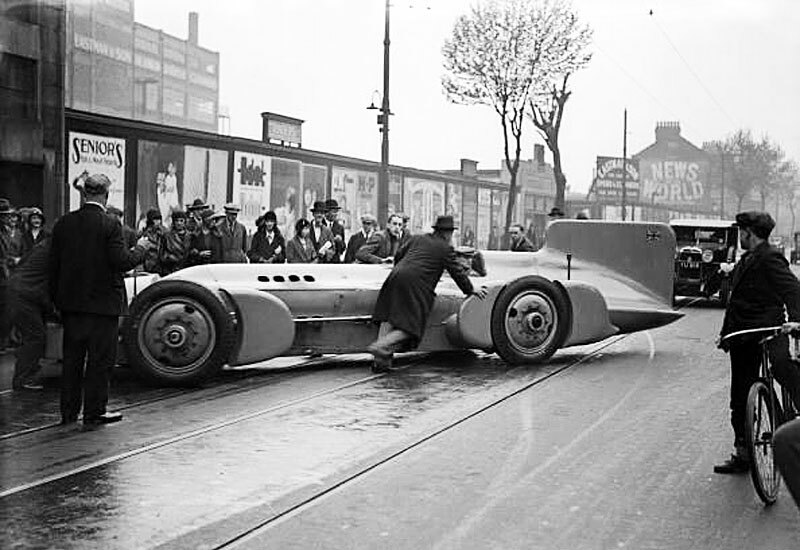 In this next image taken on May 22, 1931, Sir Malcom Campbell's Bluebird is being pushed out backwards from the Napier works on its way to the Brooklands race track near Weybridge in Surrey, England. The car had to be pushed backward because it had no reverse gear. Earlier in the year on February 5, 1931, he had set another world land-record in the United States at Daytona beach when he drove the Bluebird at 245.73 MPH (393.74 KPH). This new Bluebird had a supercharged 1,450 Horse Power engine. This new Bluebird had evolved considerably with its aerodynamic bullet-shaped design from the previous iteration, thus allowing him to drive it approximately 75 MPH faster. 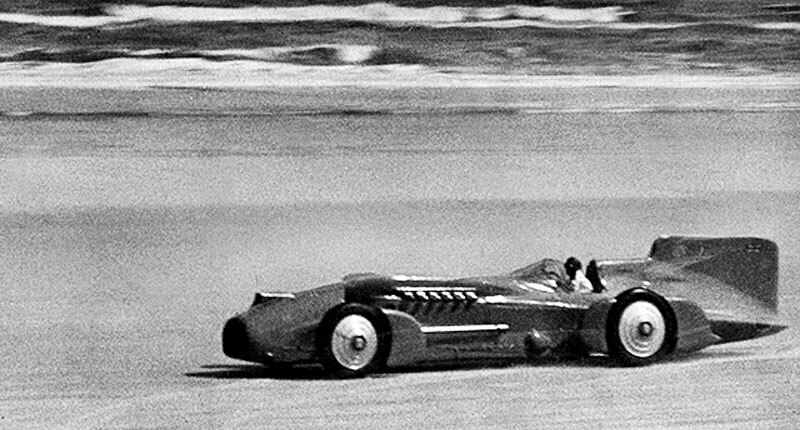 On February 24th, 1932 at Daytona Beach, Florida, U.S.A., only a year later, Malcolm arrived with a new Bluebird design that was much more streamlined with a lower center of gravity. With his new Bluebird he set yet another record when he hit 253.09 MPH (406.35). 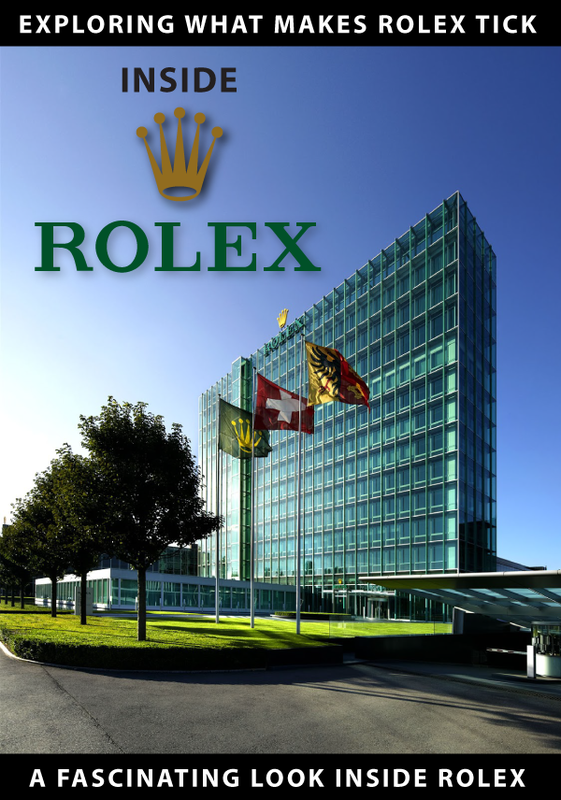 The French Rolex advertisement featured a Western Union Telegram Sir Malcolm Campell sent to the Rolex Watch Company in London. It read "Rolex watch worn yesterday during driving record attempt and still going splendidly notwithstanding rough usage received." 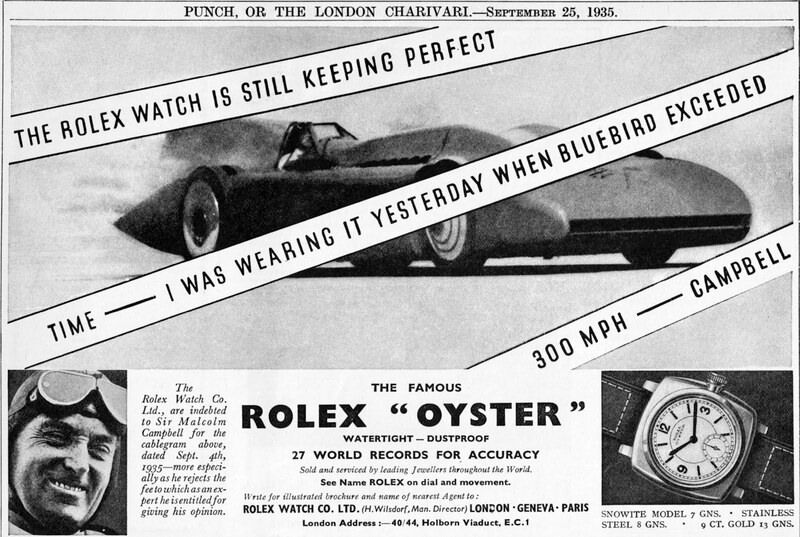 Rolex offered to pay Sir Malcolm Campbell a standard fee for allowing them to use his image to advertise this great achievement, but Campbell refused to accept their money. 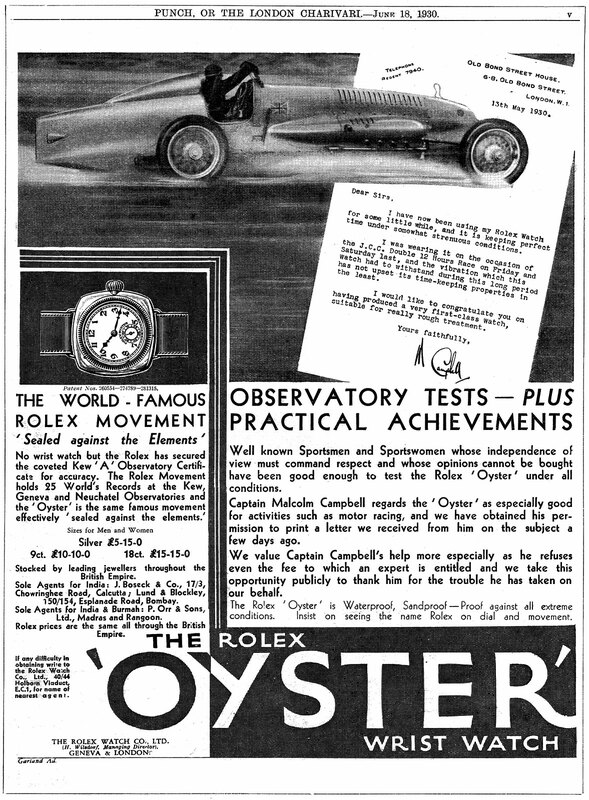 Sir Malcolm Campbell became the first male Rolex endorsement from a major sports figure. Ironically, the first major endorsement for Rolex came from a woman 5 years earlier in 1927, named Mercedes Gleitze who was the first British female to swim the English channel and she happened to be wearing a waterproof Rolex Oyster. You can read her story by clicking here. 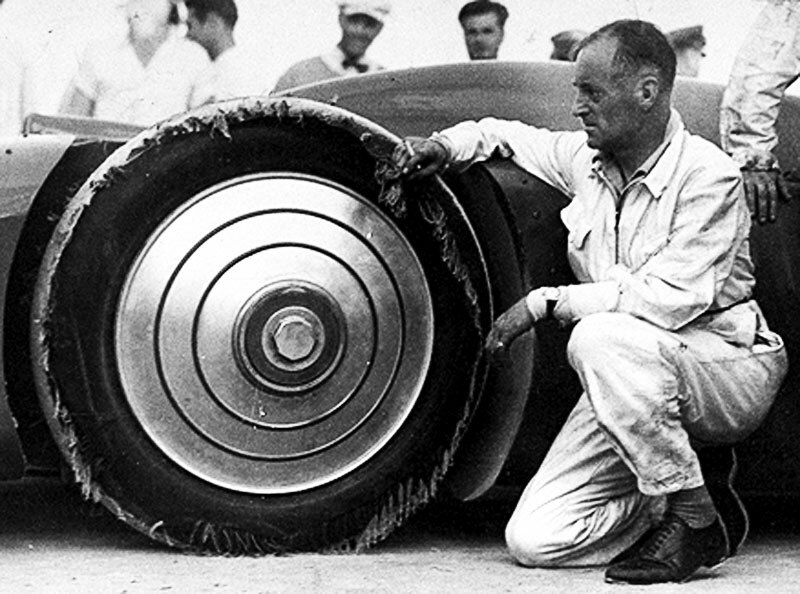 Sir Malcolm Campbell would attempt to break the 300 MPH barrier at Daytona Beach in February of 1935 at the International Speed Trials. In order to hopefully break the 300 MPH barrier, Malcolm Campbell went back to the drawing board to create an all new Bluebird design. 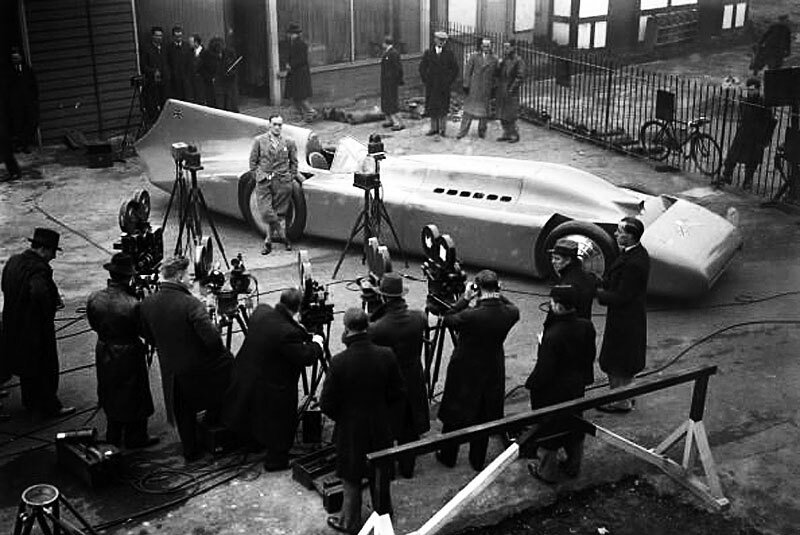 In the photo below taken at a press event, Sir Malcolm Campbell unveils his beautiful new machine. The post card illustration below shows the Bluebird, which had an American and British Flag painted on the front of the hood. I included this illustration because every one of his Blue Bird cars was painted blue, but you can't tell from the black and white photos. In the photo below Campbell is showing how the course at Daytona Beach damaged his tires during speed trails. Notice he is wearing his trademark Rolex Oyster on the outside of his racing shirt. 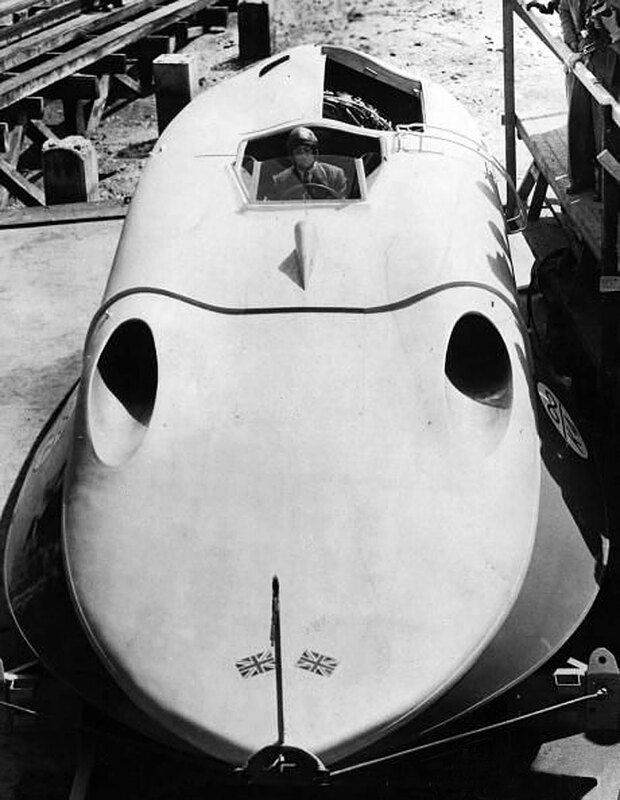 On March 7, 1935, Sir Malcolm set another world record when he hit 276.82 MPH (442.91 KPH). Before achieving this new record he ran into complications and had to wait 5 weeks for the Daytona Beach sand to become smooth enough to drive on. He broke his previous record by only 4 MPH and fell short of his 300 MPH goal. He was still excited, but would try again to achieve the 300 MPH record. 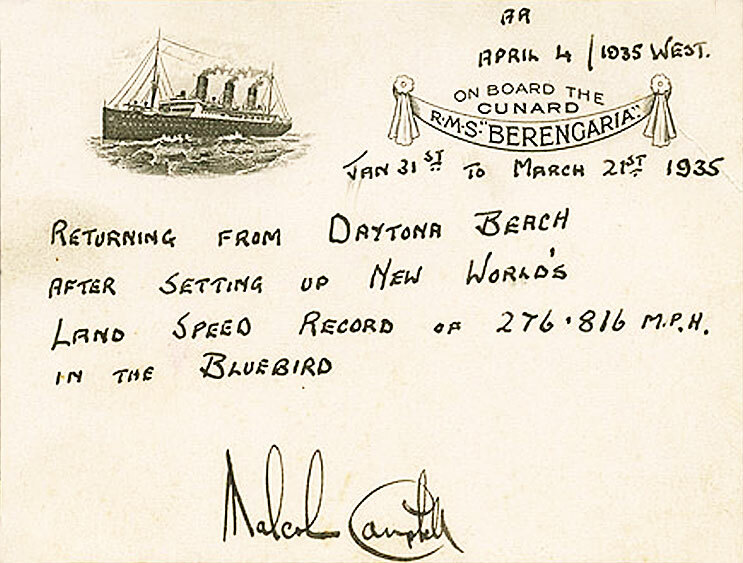 Sir Malcolm Wrote the following on a post card after breaking his new record in Daytona Beach, Florida. His trip home would be a time of deep contemplation and soul-searching. 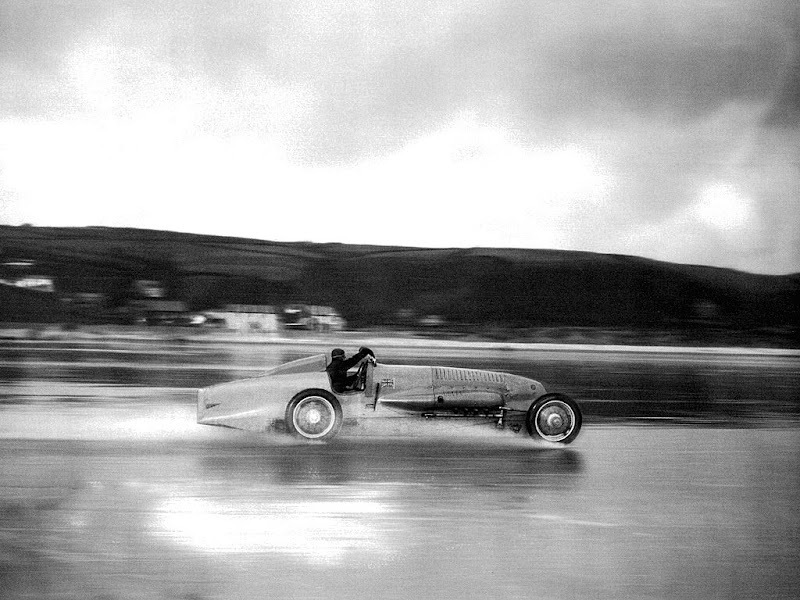 Sir Malcolm Campbell was facing a serious challenge. He knew his latest Bluebird should be able to travel at speed in excess of 300 MPH, but he had only gained 4 MPH in Daytona. 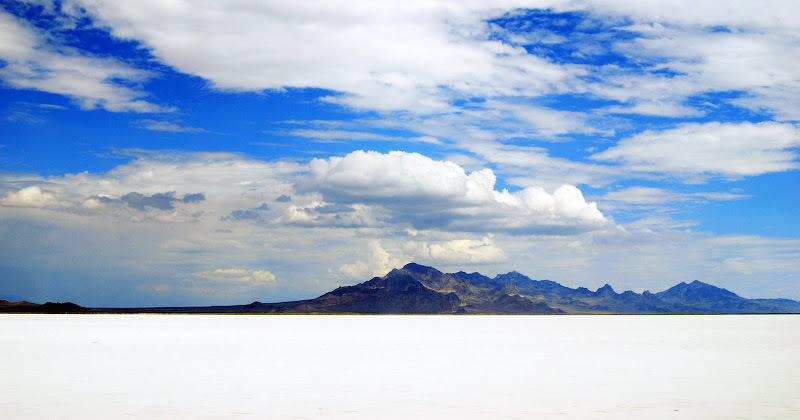 He had long been aware of another place in the U.S.A., named Bonneville Salt Flats (pictured below) that would probably be better since is was 159 square miles of flat salt surface located in northwestern Utah. Sir Malcolm previously chose to stick with Daytona Beach because he felt he knew the hard packed sand so well and was very comfortable driving on it. He made a difficult decision and switched gears (no pun intended) to go to Bonneville, Utah. This decision was made, because he realized in order to get up to 300 MPH would take a few miles and once he reached maximum speed it would take him many miles to slow down. The brakes back in 1935 were not very effective, so if he were to hit the brakes at 300 MPH they would instantly burn up. Instead he had to very slowly decelerate by ever so slightly pulling back on the gas pedal. So off to Utah Sir Malcolm went with his amazing Speed Machine. In the photo below you see the Bluebird being towed out to the area where he would begin. 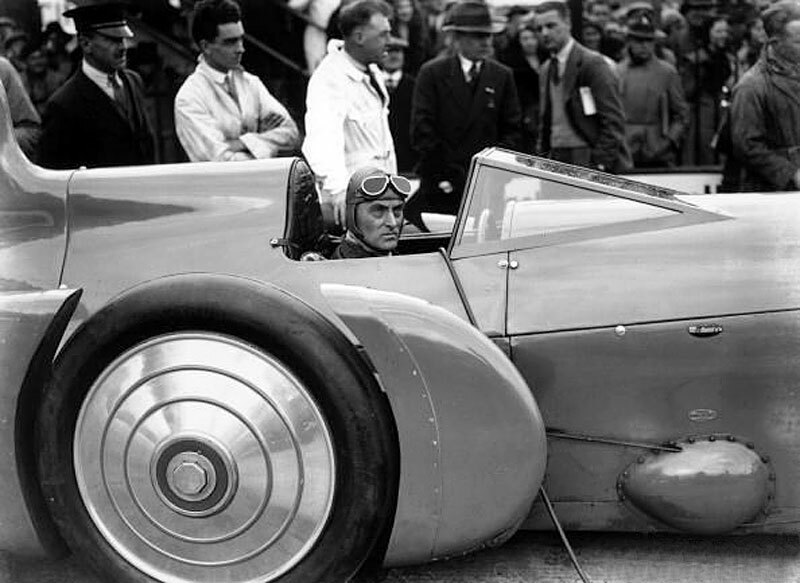 On September 3, 1935 on the Bonneville Salt Flats in Utah, Sir Malcolm Campbell raced into automobile history when he reached a maximum speed of 301.13 MPH (481.81 KPH) as seen below. 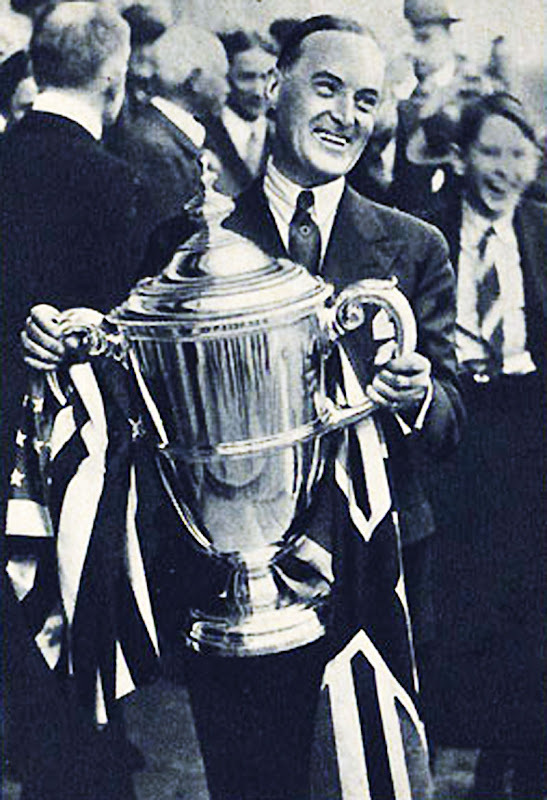 Sir Malcolm Campbell is pictured below after achieving his amazing technological feat. 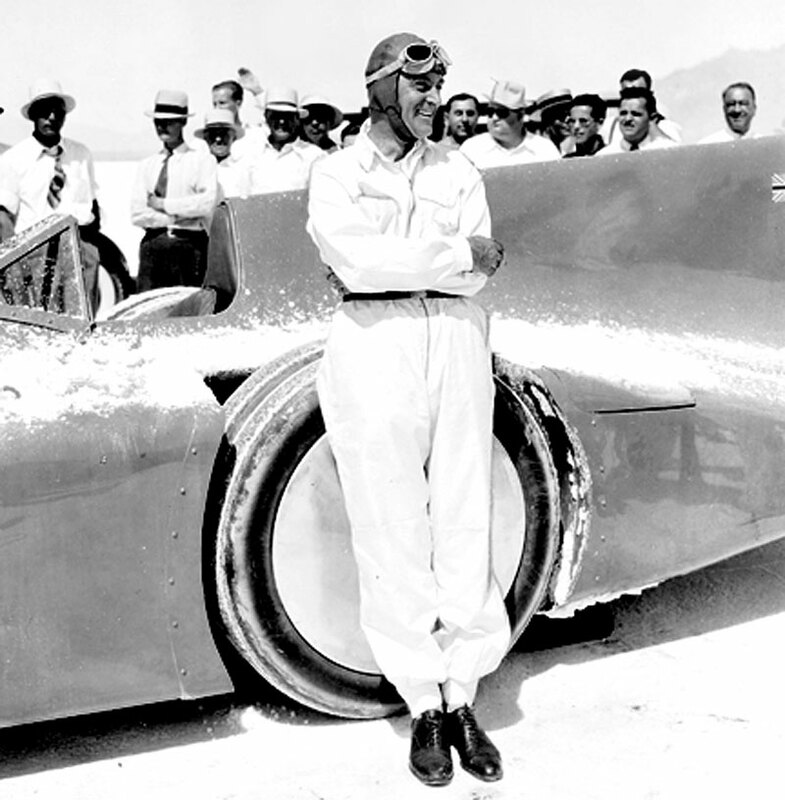 After several unsuccessful attempts to break the land record he achieved at Bonneville, Sir Malcolm Campbell switched his focus to setting water speed records, and he did just that. In the funny photo below, Sir Malcolm is looking at the water speed limit sign he would significantly exceed. 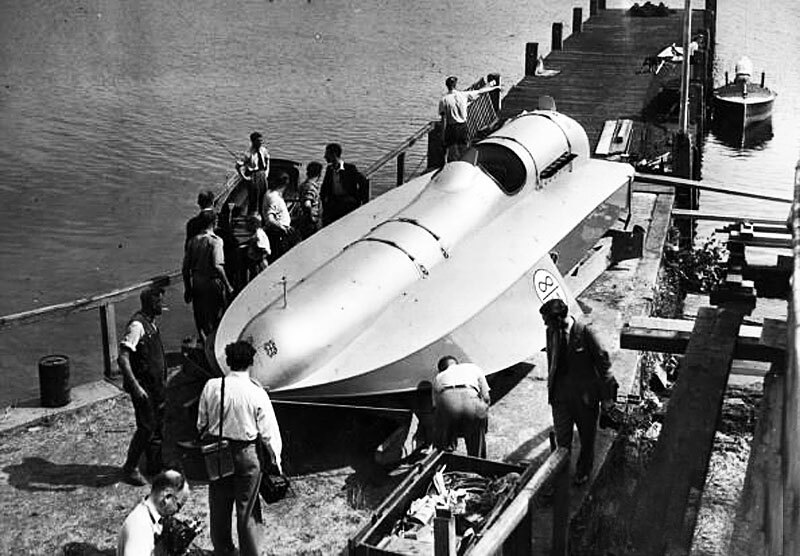 Sir Malcolm Campbell broke the world water speed record a total of four times. In the next two photos below he is pictured in September of 1938 in his first Bluebird boat which he set his first record in. 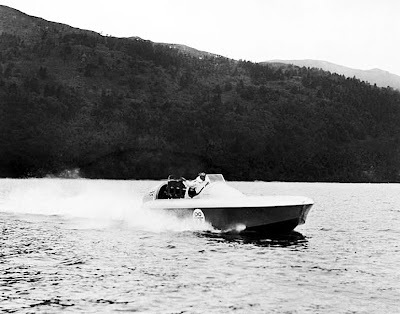 The photo below is taken in Scotland on Loch Lomond in July of 1937 of Sir Malcolm Campbell in July 1937. Sir Malcolm as he was typically referred to, kept experimenting with different designs to achieve the highest water speed possible. The photo below was taken in 1949. 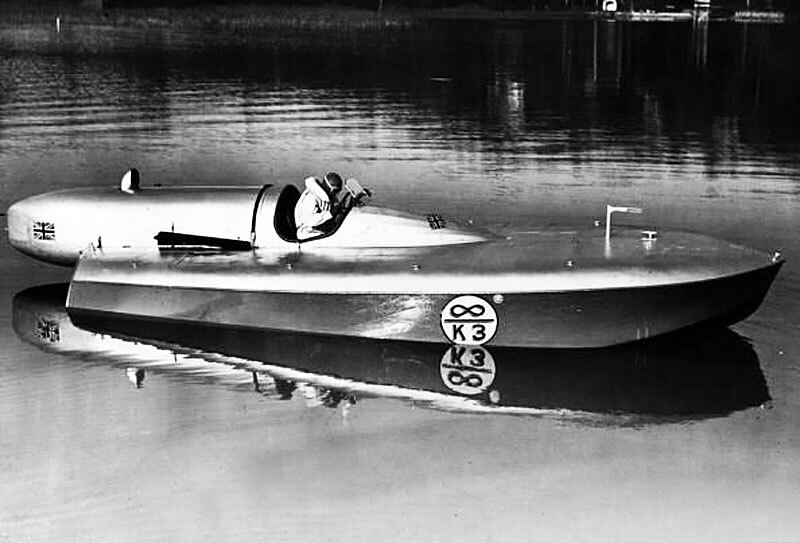 The fastest world water speed record he achieved was in 1939 in his Bluebird and he reached a speed of 141.74 MPH. 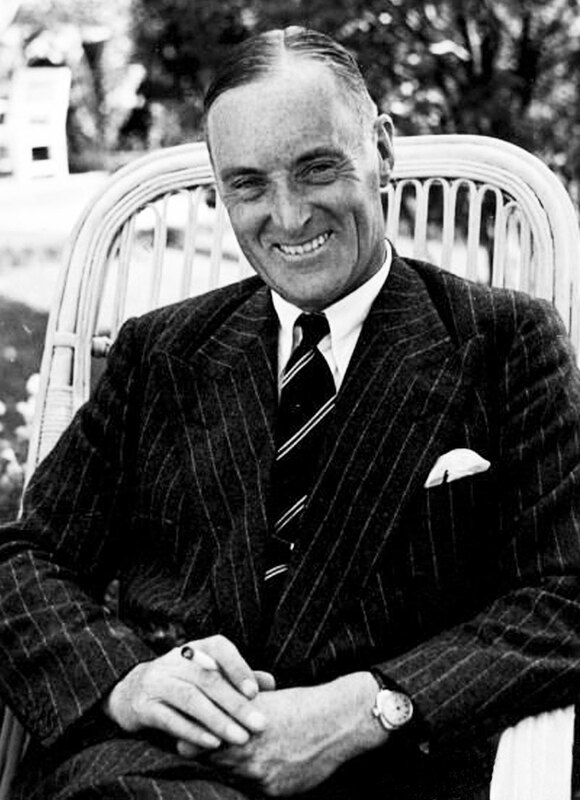 Perhaps Sir Malcolm Campbell's most outstanding achievement was the fact that he died of natural causes at the age of 63 in 1948. If you stop to think about it, it is amazing he was never involved in an accident that took his life. Absolutely remarkable!!! Sir Malcolm Campbell is one of the greatest Rolex achievers in history. 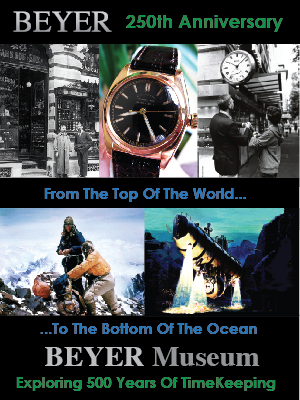 His story just goes to show how greatly people can be inspired to accomplish great achievements when they wear a Rolex on their wrist.